Last Monday, several days after the massive defeat of her Brexit deal by a margin of 230 votes, British Prime Minister Theresa May made a statement to the House of Commons setting out how the government proposed to proceed and tabled an amendable motion that the House had considered the statement. On Tuesday, the House considered the motion along with seven amendments put forward by members. Two of the amendments were adopted. One of them means the prime minister will return to Brussels and ask the EU to do something it has said, repeatedly, it won’t do – reopen negotiation of the 585-page withdrawal agreement. To many observers, what the prime minister proposed in last week’s statement was little more than what she had proposed six weeks earlier in “deferring” the vote on the agreement and the political declaration on the framework of the future relationship originally scheduled for December 11. She had said then that she would seek further assurances from the European Union that the Irish “backstop” – the provisions in the 173-page Protocol on Ireland/Northern Ireland in the withdrawal agreement that guarantee that, in all future circumstances, the border between Ireland and Northern Ireland will remain, as it is today, open and frictionless – would be time-limited. After its December 13 meeting, the European Council said it stood by the withdrawal agreement and it’s not open for renegotiation. But it also said the “backstop” is intended only as an insurance policy to prevent a hard border and it is determined to work speedily on a subsequent agreement that establishes, by the end of the post-Brexit transition period, “alternative arrangements” so the “backstop” will not need to be triggered. Toward that end, it said it was ready to embark on preparations for the negotiation of the future relationship immediately after the withdrawal agreement was signed. And it emphasized that, if the “backstop” were nevertheless triggered, it would apply only temporarily, unless and until it is superseded by a subsequent agreement that ensures that a hard border is avoided. The EU reiterated those assurances in a joint letter from European Council President Donald Tusk and European Commission President Jean-Claude Juncker to the prime minister on January 14, the day before the vote on the withdrawal agreement. While reiterating that they couldn’t agree to anything that would change or be inconsistent with the withdrawal agreement and reiterating what the European Council had said in its December 13 conclusions, they noted that those conclusions have “legal value” in the EU commensurate with the authority of the European Council under the treaties to define directions and priorities for the EU at the highest level, including, in the specific context of withdrawal, the framework of the future relationship. The Commission for its part confirmed that the EU doesn’t wish to see the “backstop” enter into force, is determined to replace it by a subsequent agreement, and understands that the withdrawal agreement and protocol don’t extend regulatory alignment with EU law in Northern Ireland beyond what is strictly necessary to avoid a hard border. And they said that, given their joint commitment to use their “best endeavors” to conclude a subsequent agreement before the end of the post-Brexit transition period on December 31, 2020, they would give priority in their work to discussion of proposals that might replace the “backstop” with “alternative arrangements, including facilitative arrangements and technologies.” They also acknowledged the parties could, if need be and as provided for in Article 132 of the withdrawal agreement, extend the transition period to December 31, 2021 or December 31, 2022. Those assurances did not, of course, persuade a majority of the House to approve the withdrawal agreement. Indeed, despite the assurances, on January 15 it was defeated by an overwhelming margin – 202 in favor and 432 against. More than one-third of the Conservative MPs – 118 – voted against the deal. And so, after having made it clear that she was opposed to ruling out a no-deal exit, revoking or extending the Article 50 negotiating timetable, or calling a second referendum, the prime minister said last Monday she would continue discussions with colleagues, including the Conservative members of the hard-Brexit European Research Group and the members of the Democratic Party of Northern Ireland, both of which feared the UK could be trapped permanently in the “backstop” and had opposed the deal. Those discussions, she said, would focus on identifying how the UK can meet its obligation under the 1998 Good Friday Agreement to avoid a hard border between Northern Ireland and Ireland in a way that commands the support of the House. She would then take the conclusions of those discussions back to the EU. As it turned out, the discussions did not identify precisely how the UK could meet its obligation to avoid a hard border between Northern Ireland and Ireland in a way that would command the support of the House. 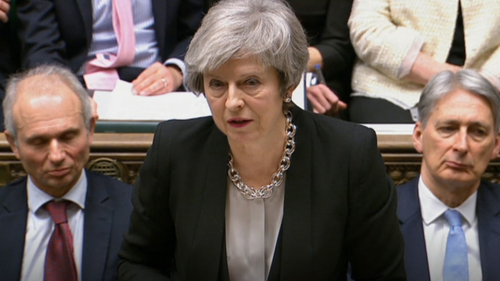 Instead, they led the prime minister to conclude that the only way a majority of the House might be persuaded to support the withdrawal agreement would be if the “backstop” were to be replaced with as-yet-unspecified “alternative arrangements” that would avoid a hard border between Northern Ireland and Ireland. Sir Graham Brady, the chair of the Conservative backbenchers’ 1922 Committee, put forward an amendment that required that the “backstop” be replaced with “alternative arrangements to avoid a hard border,” supported leaving the EU with a deal, and supported the withdrawal agreement subject to that change. After last week’s statement and motion, MPs put forward 14 amendments, all of which were designed, in one way or another, to enable the House to avoid the no-deal exit that would occur if the UK did not approve the withdrawal agreement by March 29 or, in the absence of approval, either extend the Article 50 negotiating timetable beyond March 29 or revoke its notification on March 29, 2017 of its intention to withdraw from the EU or consider other options. On Tuesday, the Speaker of the House, John Bercow, chose seven of the amendments for consideration as well as the order in which they would be voted. Not surprisingly given the Speaker’s affiliation, the Brady amendment was selected and voted upon after the other six. After rejecting the first five amendments, the House approved the sixth by a narrow margin – 318 to 310. Put forward by Conservative Dame Caroline Spelman and others, it stated that the House rejected leaving the EU without a withdrawal agreement and framework for the future relationship. But although it was put forward by a Conservative, its approval resulted from the support it received from Labour, Liberal Democrat and Scottish National Party MPs; only 17 Conservatives voted for it while 295, plus the 10 DUP members, voted against it. The Brady amendment was also approved by a narrow margin – 317 to 301. Those voting for it included 299 Conservatives, 10 DUPs, seven Labour MPs, and one independent. Only 8 Conservatives voted against it. The narrow margin of victory hardly represented the “emphatic message” and “clearest possible message about what the House wants” the prime minister had called for in opening the debate; nevertheless, compared with the January 15 vote on the withdrawal agreement, the party did at least remain relatively unified in supporting the Brady amendment and opposing the other six amendments. Nevertheless, both Tusk and Juncker have made it clear that, although the withdrawal agreement itself is not open for renegotiation, it might be possible to address the “backstop” issue in the context of the framework of the future relationship, which is described in broad terms in the separate and, unlike the withdrawal agreement, non-binding 26-page political declaration setting out the framework for the future relationship between the EU and the UK. Tusk stated yesterday, as he has stated previously, that “if the UK’s intentions for the future partnership were to evolve, the EU would be prepared to reconsider its offer and adjust the content and the level of ambition of the political declaration, whilst respecting its established principles.” And last week Juncker, in a telephone conversation with Theresa May, reportedly suggested, more provocatively, that if the UK were to change some of its red lines – most notably, its insistence on pursuing an independent trade policy – and consider negotiating a permanent customs union, it might be possible to alter the “backstop” or even render it irrelevant. But erasing any “red lines” with respect to the future relationship would undoubtedly raise red flags for the hardline Brexiters and could reopen the deep division over Brexit that exists within the Conservative Party and government even after yesterday’s votes. So it may not happen. And meanwhile, the Article 50 clock keeps ticking.